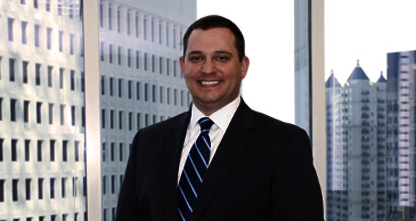 David Kincaid counsels clients on intellectual property matters across many technical fields. David’s law firm and in-house experiences span diverse industries including high-tech, automotive, oil and gas, aerospace, manufacturing, communications, and e-commerce. His practice concentrates on patent preparation and prosecution strategies for electrical and computer-related technologies. David also drafts opinions and advises clients about issues of patentability, invalidity, non-infringement, and product clearance. In addition to his patent practice, he is also experienced in copyright, trademark, and trade secret protection. Cantor Colburn LLP announced that it has hired David Kincaid as an Associate in its Atlanta office. Cantor Colburn’s Atlanta office is growing steadily, as are its other offices in Hartford, Washington, D.C., Houston, and Detroit. Mr. Kincaid is the fifth IP professional hired in Atlanta since the summer. The Georgia Intellectual Property Alliance presents the 15th Annual IP Hot Topics Luncheon, "The Future of Autonomous Vehicles & Luxurious Mobility" on May 9, 2019, in Atlanta.